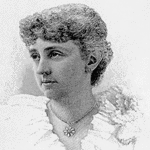 Kate Douglas Wiggin (September 28, 1856 - August 24, 1923) was an American children's author and educator. In The Bird's Christmas Carol, the arrival of Carol into the Bird family brings joy and sadness throughout the years, but her presence reminds everyone of the real meaning of Christmas. FCIT. "Kate Douglas Wiggin author page." Lit2Go ETC. Web. 26 April 2019. <https://etc.usf.edu/lit2go/authors/137/kate-douglas-wiggin/>. FCIT, "Kate Douglas Wiggin author page." Accessed April 26, 2019. https://etc.usf.edu/lit2go/authors/137/kate-douglas-wiggin/.